ClientEarth collaborated with ExCiteS to include additional functionalities in the Sapelli app allowing to create projects which provide users with easily accessible, relevant legal information. These projects are slightly different to the traditional concept of Sapelli projects, as they aim to share rather than collect information. Furthermore, the information is available for users in remote areas without internet connection. ClientEarth’s projects are based on the premise that facilitating quick and easy access to legal information can empower people to defend themselves and their environment. Therefore, their projects are designed for both those who have limited access to legal information and those, as with the example below, who wish to supplement their knowledge. One specific project was designed to provide legal guidance to members of a Legal Working Group in Ghana whose aim is to protect natural resources and local community rights. The purpose of this project was to provide the user with information on the different types of logging permits and their legal requirements in Ghana. The user would be able to quickly access the relevant legal information to support him/her during meetings or interviews. You can download the Ghana logging permits project here: Logging permits Ghana v1.142. 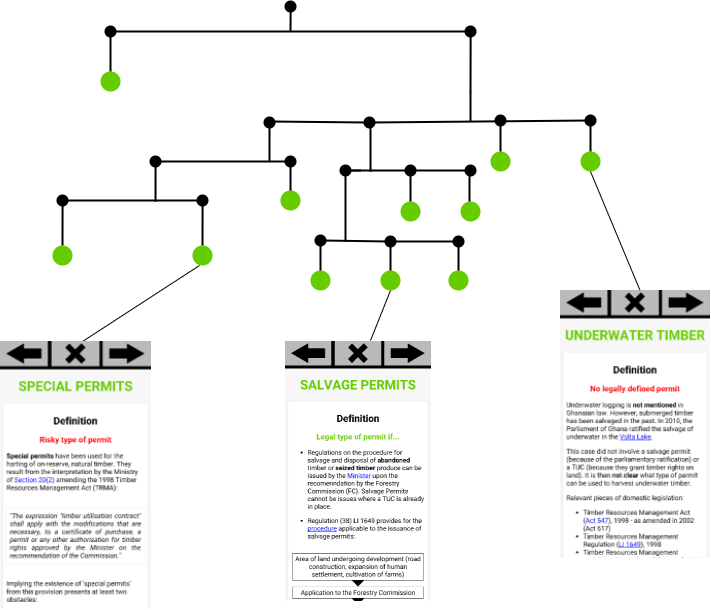 This project is set out as a decision tree with various options (Choice fields) for the user to click through. Eventually the user will reach the end of the decision tree and be provided with the information they were looking for. This information is displayed in a HTML page (webpage). The HTML page can contain further information by adding videos, images and links to PDF files or other webpages. For this reason, adding HTML pages to a project is a good way to provide users with information. The image below illustrates the layout of the decision tree for this project. The black circles represent the Choices displayed to the user. The green circles represent the HTML pages that the user will arrive at. Screenshots of three of the HTML pages have been included to give an idea of what these pages look like on the user’s device. Here you can find the code for the above project. Comments have been included in italics in order to guide you through the XML file.